Correctional systems in America face serious challenges, including overcrowding and aging facilities. While older correctional facilities can be renovated to some extent, the reality is that recent improvements in correctional design and safety can make renovations impractical. For the past three decades, we’ve built and expanded more than 60 correctional facilities. In 2018, we broke ground on a replacement facility for the 100+ year old Lansing Correctional Facility in Kansas. In addition to a more modern facility that is safer for employees and inmates, the arrangement gives the State of Kansas financial flexibility, freeing up funds for other things important to its citizens. CoreCivic Properties can site, plan, finance, build, own, manage, and maintain a custom facility that is perfectly suited to meet the needs of any inmate, detainee or resident population. Over the years, there have been modernizations in security, architectural practices, population needs and even recommended construction materials. CoreCivic has remained on the leading edge of designing, financing, constructing and maintaining corrections and detentions assets. CoreCivic Properties can design and construct a new or expanded correctional facility in 12-18 months, compared to the typical four to five years it generally takes in the public sector. 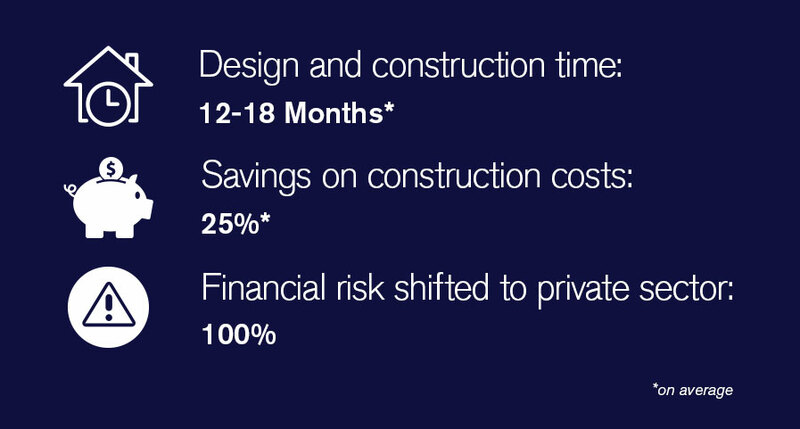 Under our real estate-only model, we shift the financial risk for the design, construction, maintenance and building life cycle away from taxpayers and onto the private sector. Additionally, we provide a savings of approximately 25 percent on new construction costs. Since CoreCivic is an alternative-funding source, governments can upgrade their correctional facilities without needing to budget for or spend millions of dollars on the cost of new prisons or jails. See how CoreCivic is working to reduce recidivism through life-changing education and reentry programming.